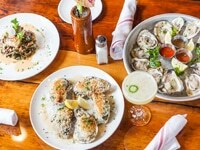 Save on your breakfast, lunch or dinner with coupons from Savannah.com! With an array of specials, discounts and deals at restaurants all across Savannah, you will be able to do even more with your vacation money! Discover culinary creations at a special price and enjoy even more delectable dishes while you’re in town! Simply click “see coupon,” print the coupon that appears and bring it to the establishment.